Modern shipping is all about change. New vessel shapes, designs, and capabilities are evolving like never before. In our Crewtoo construction series, we look at those technical changes…this time around, we go to the machinery space. For centuries ships used either human or wind power to move – everyone from the Romans and Greeks, through to even Spanish galleons and even Nelson, all were dependent on the vagaries of organic power…whether the wind or rowing. Then suddenly the late 19th century began to see the first breakthroughs and ships could be propelled and powered. Then in the 20th century fully gave way to steam, and marine engines began to get serious. The first real attempt at powered propulsion was as far back as 1673 – based on the power of cannonballs and the thrust they provide when fired. Dutch man Christian Huygens rigged a cannon but replaced the ball with a piston – and suddenly thrust was available. Sadly, the idea didn’t progress, as there was no fuel suitable. From around 1736 to 1804, there were many different ways of harnessing steam power used – and then in 1825 ‘Curacao’ built in Dover, England, became the first practical steamship to sail. The 445 tonnes, paddle-wheeler had two engines developing 75 kW. Powered vessels were seen as the future, and in 1880 the 137 meter, 5,247 tonnes ‘Arizona’ was the first steam powered vessel to win the legendary “Blue Riband”, crossing the Atlantic in the fastest time. Steam was surpassing sail, finally. The White Star Line steel hulled ship reached 17.3 knots with her John Elder & Company’s 4,679 kW compound steam engines providing a sense of what powered ships were capable of. However, paddle steamers were falling out of favour and in 1884 the first bronze manganese propeller was produced – heralding a new age, and one which is almost recognisable today. Fuel was still an issue – and in 1904 Sulzer installed their first diesel engine in a ship, the freighter ‘Venoge’. However, for scale and power it was still coal and steam which were the rage. The triple-screw steamer “Titanic “is often heralded as a major leap in technology – but the White Star Line’s major rival, Cunard, was already operating the quadruple-screw, turbine-driven sister ships Lusitania and Mauritania. The race was literally on to make the most of power, to go faster and further. The Titanic was propelled by a combined machinery arrangement consisting of two reciprocating engines and a single Parsons’ turbine, which needed vast amounts of coal to be burned in order to make steam. The total bunker capacity was some 6611 tons of coal. To work the 24 double-ended boilers while at sea during a four-hour watch period required 48 firemen, 20 trimmers, and 5 leading firemen, sometimes called leading stokers. Both the First and second World Wars saw great technological leaps, and suddenly coal gave way to fuel oil and diesel. The modern age of vessel propulsion was born and has continued to shape the way ships are powered today. 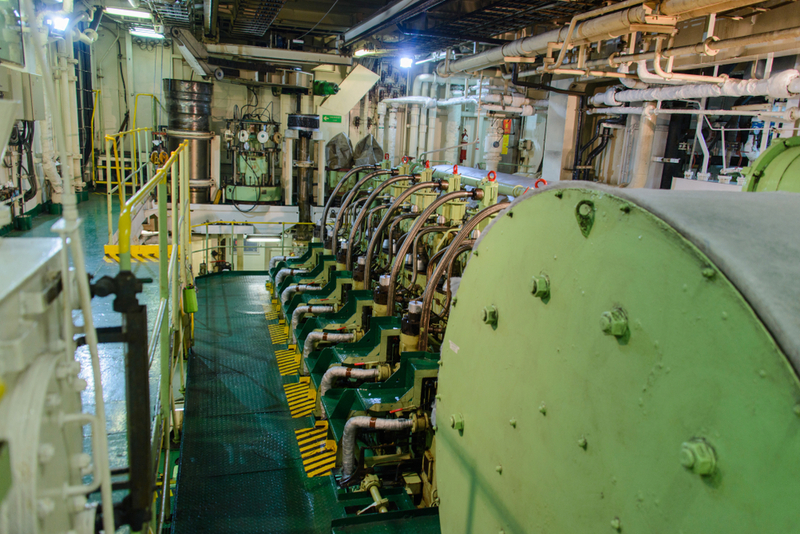 The name “engine room” is an old term which perhaps hints at the fact that engines were seen as something distinct and separate from the rest of the vessel. Now, the term used is machinery space. This is because they house so much more than just engines. They are the places to find boilers, auxiliary power, pumps, lubricating systems, air compressors, water pumps, generators, fuel oil systems and access to bunker tanks, power plants and of course the propeller shaft – which runs from the machinery to the propellers. There is also the engine control room – ECR – where the engineers can monitor what is happening with regards to the vessel’s machinery. Temperatures, pressures, voltages, ullages, and a whole swathe of vital data sets are managed from here. This in turn is sends the relevant and necessary data and information to the Wheelhouse. It is also where detailed records are generated into vessel performance – speeds, consumption, spare parts inventories and maintenance schedules. Engineering officers and crew operate and maintain all the propulsion, power generation and distribution systems throughout the ship. Seafarers working in the ship’s engine room fall under the engine department. Obviously, engineers are a relatively new development – as for centuries vessels were sail powered. So marine engineers do not have the heritage of their deck counterparts, but as sail gave way to steam, they came to the fore. Marine engineers wear epaulettes with the usual gold braid, in keeping with other officers. The Chief Engineer having 4 stripes, the Second engineer wearing 3, Third wearing 2 and the Fourth Engineer wearing one stripe. Engineers start as cadets, and work their way through the ranks, certificates of competency – these include EOOW, Engine Officer of the Watch, Second Engineer and Chief Engineers ticket. There are also electricians and Electro Technical Officers in this side of the shipboard structure. Most modern ships use reciprocating diesel engines, these are relatively simple, robust and offer reasonable fuel economy. One of the biggest leaps in shipping has been the launch of Maersk’s first round of giant container vessels. The Triple-E class container ships, with a container carrying capacity of 18,000TEU. The Triple-E (EEE) stands for economy of scale, energy efficient and environmentally improved vessel. Each has a twin skeg propulsion system, with two slow running ultra-long stroke engines. Each engine will drive a separate propeller, and produces 43,000hp and weighs 910t. Consuming 168g bunker oil per kWH produced. Each of the two propellers is 9.8m diameter with four blades. While size matters, fuel seems to be the next big battle ground for engines. Much is being made of the use of LNG as a marine fuel, and with pressure to lower emissions and to cut the sulphur content, then it seems that such advances are likely to really take off. If it hadn’t been for recent drops in the price of oil, perhaps these would already be increasingly common. Change is coming though, and the next 100 years will see a further refinement – with vessels operating on LNG and even more electric vessels appearing, the engine room will evolve further. It is also likely that unmanned machinery spaces will also extend to unmanned ships. However, this still seems some way off. Until then, most engineers will become ever more able to deal with cyber and electronic control system issues. The nature of marine propulsion is changing – and while there is still a need for the kind of dirty hand and heavy lifting mechanical elements, the role is evolving to encompass a more advanced level of technical expertise. Machinery spaces of the future will become quieter, cooler, perhaps even smaller as power plants change. The use of gas is the next big change, but from there the use of electrical power is likely to see the biggest change to engines and machinery spaces in hundreds of years.